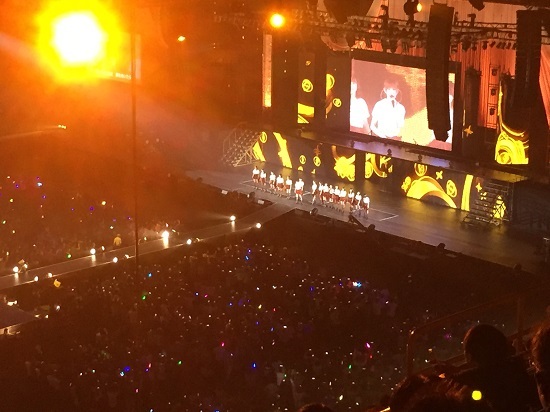 When they announced the third round of applications, it was because the concerts didn’t sell out. Wait a second? Didn’t sell out? But I lost all four applications? How can this be??? Moreover, after the third round was over, they announced that it still didn’t sell out, and tickets would be available at the box office on the day of the concert. This begs the question; Why are people losing, and the show didn’t sell out? I’m not saying this is exclusive to foreign fans either, since I know a lot of Japanese fans who also got shut out of the lottery. Not to mention, I also know foreigners who won all the shows. But this kind of stuff just makes it even more obvious that there is nothing really random about the ticket center at all. And to be honest, it really pisses me off. I remember a time before the ticket center existed when the AKB48 lottery process seemed completely random and fair. I have no idea why the company has turned it into what it is, but it is obvious that they are screening all applications, and deciding who gets to win, and who doesn’t. Anyway, rant over. 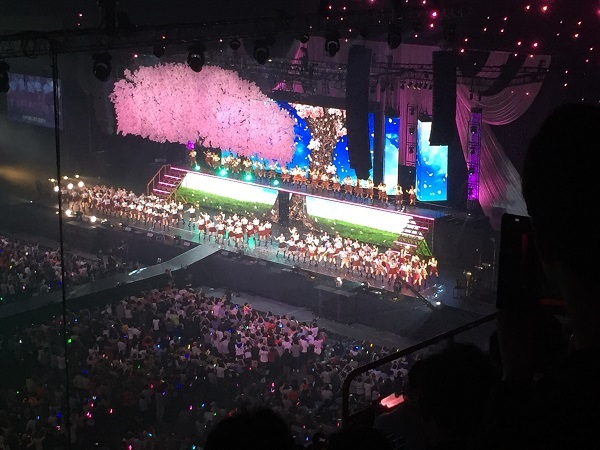 First, the HKT48 concert ultimately didn’t sell out. They were still trying to sell tickets just before the show started. Second, reliable sources told me that there were “lots of tickets” left for both AKB shows. So I decided that I would head back over on Sunday, and get a ticket for one of the AKB shows too. So that was my plan, one show for each day. 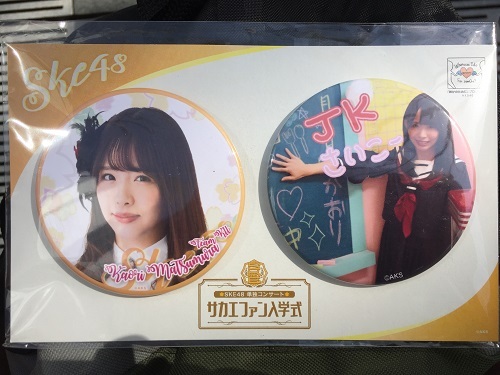 Kaotan the JK, I love it! The girl selling it started laughing at my friend’s and my reaction to seeing the button. After that we headed to the HKT side. The HKT booths had been open for a while, so the queue was short. 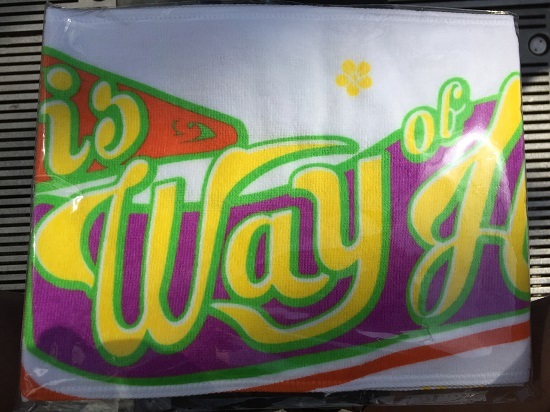 That is, unless you wanted to buy the manually decorated Uchiwa. There was a big queue to use the tables for that. 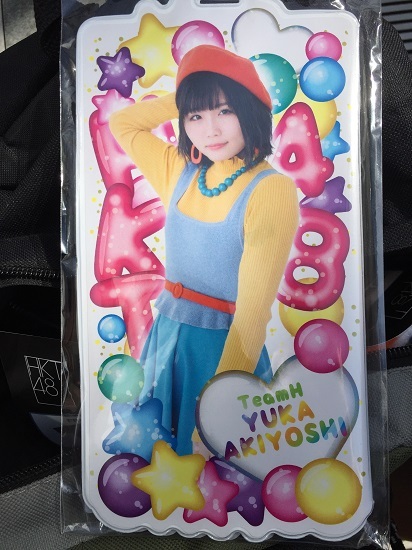 Ultimately I decided to grab a new Akiyoshi ticket holder, and a concert towel. They had some shirts in XXL, but I didn’t love them. So after hanging around the arena for a couple hours, we finally got our tickets and headed into the venue. 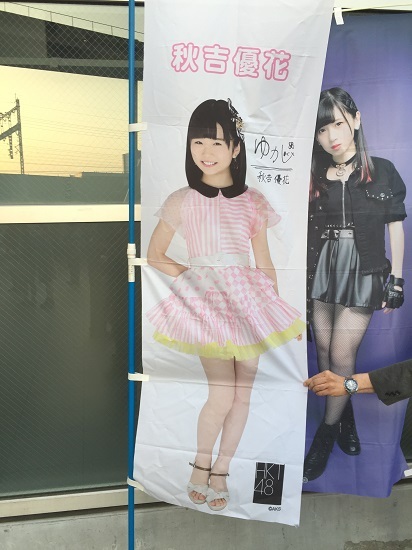 But not before I had a chance to snap a couple of pics of the HKT flags. I first found Bibian, but she was in the middle of the photo trading area, so I could only get a long shot. 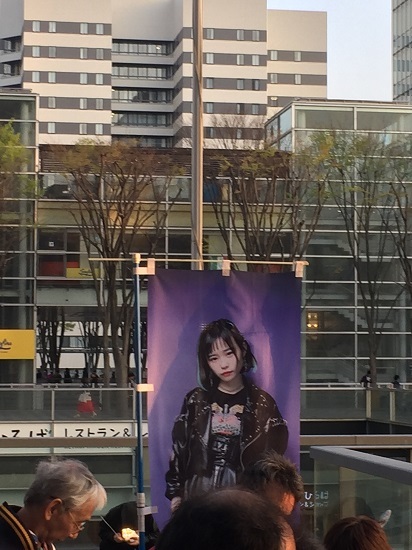 I couldn’t find Maichan’s flag, but I found Yukachan right at the arena level entrance. I had my friend hold it steady since it was kinda windy. They started with a VTR on the proper use of uchiwas. This is one of the things I love about HKT concerts, their little vignettes in the VTRs are so funny. The star was Imamura Maria, but Akiyoshi also had a nice little part in it. 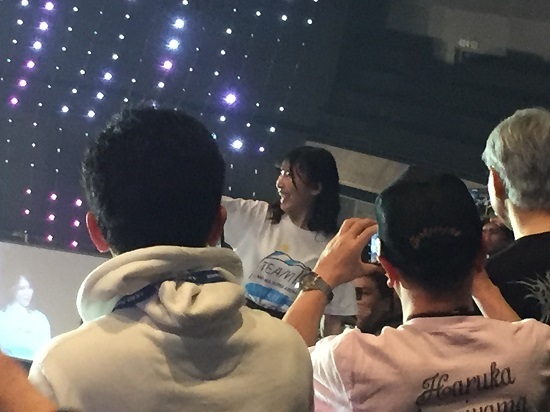 At one point Imamura is cheering for Yukachan with a giant onigiri uchiwa, and smashing it into the other fans. 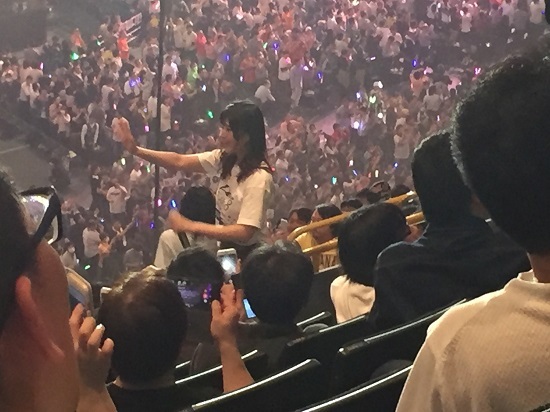 Later on, she has one of the homemade uchiwas, and is cheering for two different members by flipping it around. Meanwhile, Akiyoshi is peeking from behind the curtain and pissed off, LOL. Dirty DD! I didn’t see it, but at beginning of the concert she fell off one of the stage runways and broke her foot. Amazingly, she performed the rest of the concert, and only afterwards did they realize that there was a serious issue. I saw her dancing and running around. 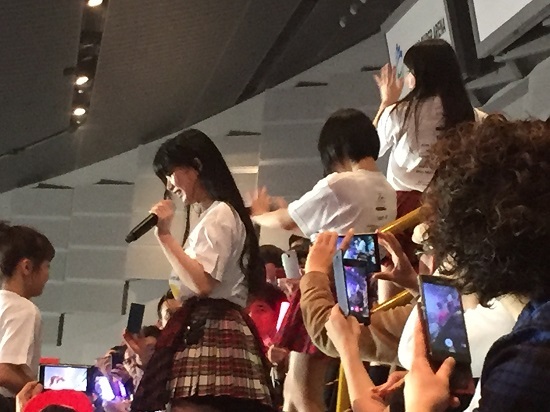 Heck, she even had a big part in the live skit in the middle of the concert. BTW, I talk more about Yukachan’s broken foot in my previous post. The best part of the show was when they allowed us to record and take pics. 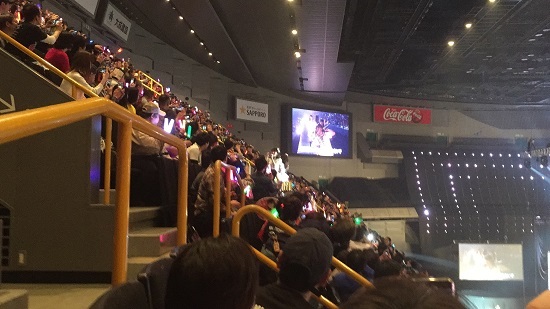 They did this in the HKT show too, but the members came nowhere near us. This time we got a bunch of 16th Gen get pretty close to us, so that was a lot of fun. Overall, I liked the AKB show a bit more than the HKT show, but that was mainly because of the sound. These days I’m a much bigger fan of HKT than AKB. But since the sound was louder and more full, it seemed more exciting, which makes a big difference. After the show ended, I briefly contemplated buying a ticket for the evening show. But ultimately decided I would be happier not shelling out the extra 8000 yen, and instead wemt home to enjoy the rest of Sunday. After seeing that the evening show was pretty much more of the same thing, I was happy with my decision. I’m more of a theater guy anyway. 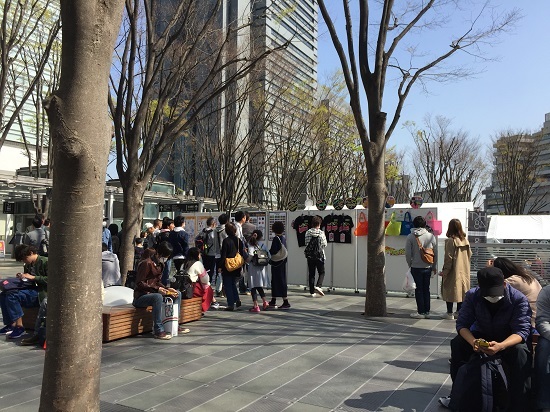 But it was nice to at least experience some of the 48-groups’ Spring Tour.